It’s not the fall that kills you; it’s the sudden stop at the end. This quote from Douglas Adams, author of The Hitchhiker's Guide to the Galaxy, sums up the key issue with falls from height; if you haven’t been able to design out the risk of a fall, the correct selection of working methods and PPE can prevent that sudden stop at the end. For as long as there have been buildings and structures, people have been working at height. The ancient Greeks and Egyptians used hawser laid ropes made of water reed to suspend workers at height. An early form of rope access involved the bosun’s chair, which was originally just a short plank or swath of heavy canvas, which was used as a seat at the end of a rope. This method was notably used in the building of the Hoover Dam in the 1930s by men who were known as High Scalers. These are still in use today; however, there are many more safety precautions taken in the current versions of the bosun’s chair. These include safety devices similar to those found in rock climbing harnesses such as safety clips and additional lines. What exactly is ‘working at height’? The UK’s Health and Safety Executive (HSE) defines working at height as work in any place where, if precautions were not taken, a person could fall a distance liable to cause personal injury. It is important to note that working at height does not include a slip or trip on a level surface, as a fall from height has to involve falling from one level to a lower level. Equally, walking up and down a permanent staircase in a building does not constitute working at height. Falls from height can result in nonfatal injuries as well as fatal ones. In the UK construction industry, of the 196 fatalities in the five years up to and including 2016/2017, 49% were related to a fall from height1. In the year 2016/2017, 18% of the 5,055 non-fatal injuries in the UK construction industry were related to falls from height2. In the UK, the Work at Height Regulations 2005 have been put in place to comply with the Temporary Work at Height Directive 2001/45/EC. The Work at Height Regulations apply to all work at height, where there is risk of a fall which could cause injury to individuals. They place duties on employers and those who control any work at height activity, such as facilities managers or building owners who may contract others to work at height. The hierarchy of controls stipulates that the best way of mitigating against the risks, is to avoid working at height completely. It is often a challenge in construction to avoid, but through early contractor involvement with designers and manufacturing, working at height can all but be eliminated. Solutions in construction involve off site manufacture of structures and ground up construction techniques for tanks and other large structures. For inspection purposes, remote vehicles and drones are being utilised above and below ground. 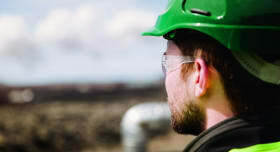 If working at height is unavoidable, there are other mitigation measures to consider. When selecting these, collective measures should be selected if possible before personal protection measures. Some of the options are outlined in the following sections: mobile elevating working platforms, scaffolding, rope access, fall arrest, restraint or protection, and ladders. It is worth noting that the most significant MEWP dangers arise from the operation and use of the machine rather than from their movement as a site vehicle. Entrapment – there is a risk of operators becoming trapped between part of the basket and fixed structures or becoming trapped against the platform controls. In the latter case, they may not be able to stop the machine from running. Overturning – this could cause the operator to be thrown from the basket. Falling – the operator could fall from the basket during their work activities. Collision – which could occur with pedestrians, overhead cables or nearby vehicles. When selecting MEWPs as a method for working at height you should ensure that a risk assessment and suitable control measures are put in place. You should also ensure that MEWP operators have attended a recognised operator training course and can demonstrate this with a certificate, card or licence. Additionally, you should make sure that the operator is familiar with the controls and operation of the specific MEWP they will be using. Finally, you should ensure that daily visual checks, regular inspections and servicing schedules are established in line with the manufacturers’ instructions. These examinations should include, as a minimum, a sixmonthly inspection by a competent person or in line with an examination scheme which has been written by a competent person. Correctly installed scaffolding provides one of the best solutions where long duration works need to be undertaken. It is worth remembering that it is often not cost effective to put permanent access in place when you only need low frequency access. Any permanently installed access will need regular inspection. It is more cost effective to install what is needed when it is needed. With modern designed and system scaffolds the available configurations and loadings can surprise many with their flexibility. It is worth remembering that scaffolds can be suspended to allow access below as well as above. Rope access techniques have been developed to the point where it is now a chosen means of access for much of the work in the offshore oil and gas industry as well as in construction, civil engineering and the built and natural environment. This is a key consideration when considering how maintenance will be completed in the future. It is not good enough to design a structure and let the maintenance engineers of the future work it out. For example, St Pancras International station in London is a 21st century solution to a 19th century design. 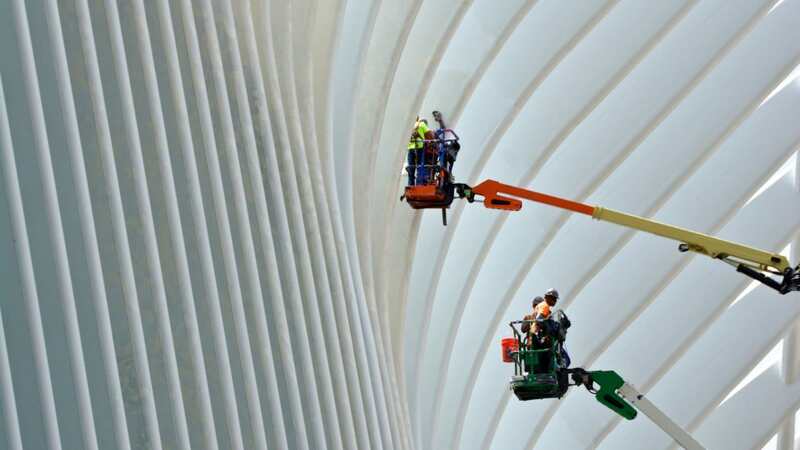 In restoring the train shed to its 19th century glory, self-cleaning glass was installed to reduce the risk of people needing to access the structure. However, as rope access became a more popular solution IRATA (Industrial Rope Access Trade Association) International was created in 1987 as it was recognised that the legislation at the time did not cover rope access techniques. International code of practice – all technicians working in the industry are required to be trained and assessed in accordance with the IRATA International Training, Assessment and Certification Scheme. Membership audit – all companies wishing to become members if IRATA must be audited by the association to confirm they are working to the guidelines. These audits look at all aspects of rope access management including technical and quality assurance. Fall arrest, restraint or protection? Different equipment is available for each of these three. Fall protection is where a person is prevented from falling in the first place, e.g. by a guardrail. Fall restraint allows the person to move freely, but not far enough to fall – known as a ‘Mansafe’ system. Fall arrest involves the safe stopping of a person already falling, using eyebolts and appropriate cables, and is the technique of last resort. When should I use a ladder? Ladders should only be used for working at height where the requirement of the activity is both low risk and of short duration, or where there are existing workplace features that cannot be altered which require the use of a ladder. As a guide, if the task being undertaken would require the individual staying on a leaning ladder or stepladder for more than 30 minutes at a time, it is recommended that you consider alternative equipment. You should only use ladders in situations where they can be used safely. For example, where the ladder will be level and stable, and where its reasonably practicable to do so, the ladder can be secured. As we know from the HSE’s definition of a fall from height, you do not need to be above ground level to fall from a height. The risk of falling from ground level into an opening in the floor or a whole in the ground is also considered as working at height. In these circumstances, there are also other risks which must be taken into consideration such as confined spaces. In the UK, there are qualifications available on managing these, the most recognised of which is the City and Guilds High Risk Confined Space 6150-03. Although this looks mainly at the risks associated with confined spaces, a key element of the course covers the setup of harnesses and fall restraint/arrest equipment. Imagine having to consider all the issues of working at height while at the same time having to wear breathing apparatus, and working in confined spaces. You should consider the individual: do they have sufficient skills, knowledge and experience to perform the task? If they are being trained, you should ensure that they are being supervised by a competent individual. Identifying competence will vary depending on the level of risk and duration of the work being undertaken. For example, low risk, short duration tasks involving ladders may simply require ensuring employees receive instruction on how to use the equipment safely, for example how to tie a ladder properly, and that they have the appropriate training. When a more technical level of competence is required, for example drawing up a plan for assembling a complex scaffold, existing training and certification schemes drawn up by trade associations and industry is one way to help demonstrate competence. Whilst we are predominantly talking about individuals falling from height in this article, it is worth remembering that if there is a risk of an individual falling, there is also a risk of other items falling and striking those below. Follow the hierarchy of control measures: - Avoid the need to work at height, for example, by using extending equipment from the ground or remote inspection vehicles. - Prevent falls using appropriate access equipment: work platforms, secondary grills under access chamber covers, or rope access techniques. Also Reduce the distance and consequences of a fall should one occur. Select the right equipment for the job and ensure you inspect it before use. Make sure the person has received and understood the training they need, i.e. they are competent. Keith Hole is a specialist in the implementation of behavioural management techniques in health and safety. He is currently the vicechair of the Institution of Occupational Safety and Health’s (IOSH) Construction Group, supporting its 14,000 members worldwide.